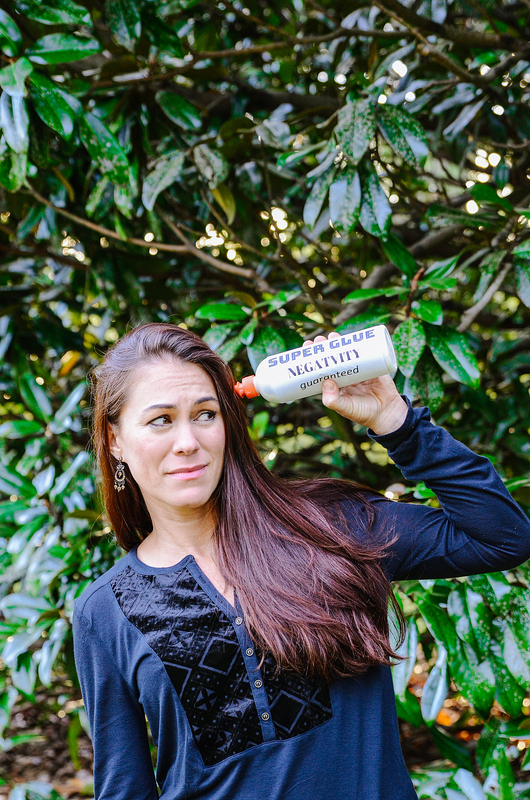 Why Is Negativity Like Super Glue? And how to break the bond. Does feeling optimistic seem really hard sometimes? Like negative thoughts have been applied to your skull by minions with a big tube of super glue, causing your zest completely flat line? Leading you to drink more caffeine and buy pinatas in bulk, so you can beat the crap out of something and then eat some candy? All while seriously considering selling your children, dog, and husband for money to take a sabbatical? Welcome to the brain, your negativity bias, and how you’re wired. Here’s how it works, whatever you think travels through circuits of neural networks in your brain. The more you think something—My job is a soul-sucking vampire, my hair looks like swamp thing, she’s a manipulative pre-madonna, this wrinkle makes my face look like a tarantula—the easier that path becomes for a thought to travel down again and again. It’s like muscle memory when you work out, that repetition applies to your thoughts as well. Scientists say we have between 30,000 to 60,000 thoughts per day, the majority of which we’re completely unaware. This fact makes my brain feel like it’s been overcooked and my eyeballs want to melt. Which probably explains why I surprise myself with thoughts I think and even some of the choices I make. “What was I thinking??????? ?” My point exactly. Neurons, otherwise known as brain cells, communicate with each other via an electrical communication system. Neuroscientist Joe Dispenza is famous for saying, neurons that fire together wire together. Which basically means repetitive thought wires us to think in certain ways. If you want to change that wired connection it can feel like deconstructing super glue. Our brains like efficiency and routine. Any change of habitual thought requires the brain to work at unsticking those electrical connections and honestly, it would rather do what it knows. Not because it’s against you, but because it likes to save energy, maybe it’s a little lazy or possibly it’s environmentally conscious and likes to recycle! The perspective of your life is built on what you think. The more you think something, the more you’re wiring yourself to think it in the future. The sobering, pass me a cup of black coffee reality is, a habit-driven brain won’t distinguish between good and problematic thoughts; it just repeats. It simply wants efficiency and speed. Which means your life could feel like a little ray of sunshine or a little ray of Darth Vader. The fact is, you are an incredibly efficient machine! But unfortunately, you’re not banking up extra credit on your electric bill with all those thoughts. No, you are building connections and using a little super glue to ensure a solid structure. Habitual thinking literally remodels the brain. Negativity also has superpowers because survival often depends on our skill at giving more attention to danger. This is our negativity bias. Rick Hanson, Psychologist and author of Hardwiring Happiness, says “The brain is like Velcro for negative experiences but Teflon for positive ones.” Bad news is stored into long-term memory quickly. While positive experiences need to be held in our awareness for more than 12 seconds in order for the transfer from short-term to long-term memory. And apparent, y negativity has covertly overthrown the english language. There are 62% negative emotional words and only 32% positive ones. All this could get discouraging when you’re trying to battle that huge tube of negativity headed straight for your brain. But the reality is noticing what’s sticking to your brain, is in fact, progress. If negativity is stuck to you, don’t force yourself to think positive thoughts when you’re actually 3,000 miles from actually feeling optimistic. Instead think a thought that is one step away from the negative thought. Then create a third sentence that is two steps away from that one. . . and so on, until you build momentum out of the negative thought. The rule here is be general not specific. For example: My job is a soul sucking vampire, is pretty specific. So go general: My job is pretty bad, but I manage to get through each day. I really don’t like it at all, but it does pay. Not everyday is terrible. I know this is leading to job change. This isn’t permanent. I can find other options. I do have a choice. I can make this situation better. Continue reaching for thoughts that feel better and better. Practice this and it will deconstruct negativity every time, I guarantee! Fascinated by human happiness achieved through the integration of movement within business, environment, and health, Eléa Faucheron is dedicated helping people transform the way they deal with stress. She is a certified Co-Active Coach, author of MOVE THINK SMILE. BurnOut to BadAss, a kiteboarder, motorcyclist, founder of MOVE THINK SMILE and a former action sports retail owner.